Snack Girl lives in the middle of nowhere. 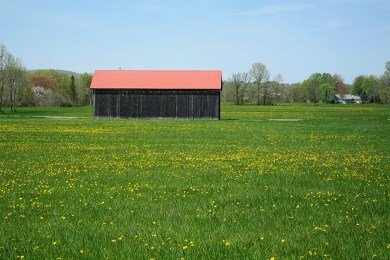 Sometimes, this isn't so bad - notice how this barn roof is the same color as the Golden Gate Bridge? There are some benefits to nowhere. For example, there is a farm product from the next town over called "Hadley Grass". I was excited to see what farmers had in store for me when I pulled over at a local farm stand. ASPARAGUS! I am not kidding you. This vegetable grows so well out here that they call it "grass" - and it was with great happiness that I bought some. Isn't she cute? 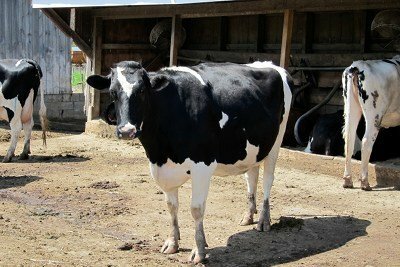 I am lucky that I can get to know my local cows and farmers! This particular dairy is in Hadley and they make a special kind of ice cream every year at this time. I heard of this concoction and stopped to find it. 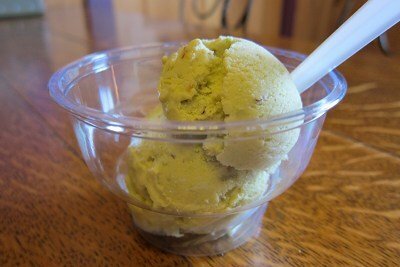 Yes, folks, this is asparagus ice cream. The dairy grabbed some of the fresh stuff and mixed it with some fresh cream and milk (and some walnuts) and created this interesting flavor. I am actually sorry I tried it because it is delicious and I found myself craving some more. The asparagus flavor isn't bitter - it is sweet and somehow it works. I can't really explain how it works - but, trust me, it works. Go get some asparagus and have some fun with it! Love that you gave a shout out to Hadley and the farm community there. :) :) I grew up out there in the Valley. .. We must be neighbors. I live in Holyoke and I adore my Hadley grass! Sounds good, I just love asparagus. When I went to the garlic festival in Gilroy, Ca. eating the garlic ice cream was really tasty. Some things just sound funny for ice cream but you have to give them a try. For those of you who don't know, a CSA is Community Supported Agriculture. Families pre-buy a share of a farm's harvest which reduces the farm's risk and provides farmers their seasonal start up costs. Then the family gets a weekly delivery of fresh, often organic, local produce. I've eaten greens this year I've never heard of before and liked them all. It's a surprise every week and we're certainly eating more vegetables in our house! I love asparagus & strawberries on my salads! Ah I would love that. Asparagus growing like grass, what is better! This reminds me I need to hurry up and sign up for my CSA before it is too late! I live in Hadley, it's nice to see you mention us and our outstanding grass! I love the idea of asparagus ice cream. Here in South Florida where we have an abundance you sometimes find avocado ice cream. It, too, is delicious.